Customers who enroll in the rewards program at the Rainforest Cafe will automatically become members of the larger Landry’s Select Club program. Customers will immediately enjoy a $25 welcome gift which can be used at any participating Landry’s restaurant. As customers eat and spend at participating locations, they will receive 1 point for every dollar they spend. Once customers reach 250 points, customers automatically receive $25 in restaurant rewards. The perks of being a Select Club member don’t stop there. Members also receive a $25 birthday gift and special email offers for their favorite restaurants. 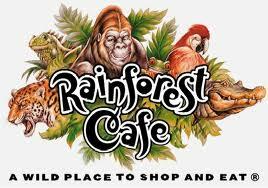 Since the Rainforest Cafe is as famous for their wild merchandise as they are for their food, Select Club members will go ape for the 10% discount they can receive at participating locations. Select Club members also enjoy preferred seating at participating restaurants, as well as special offers at some of Landry’s entertainment and hospitality locations. Given the breadth of options available to Select Club members, one can expect that customers will be eager to sign up. For a complete list of rewards, as well as the terms and conditions, please visit the Landry’s Inc. website.